I love caprese salad in the summer. In the winter I turn this salad into an open faced sandwich. I'm not the first person to do it for sure, this is my favorite variation. The key to this is sandwich is lightly toasting the ciabatta first. You don't want to brown the bread, just make it a little crusty. This ensures that the moisture from the olive oil, mozzarella and tomato doesn't make the bread too soggy. Create a mixture of basil and olive oil. Once the bread is toasted I spread on a liberal amount of your basil and olive oil mixture on to one side. 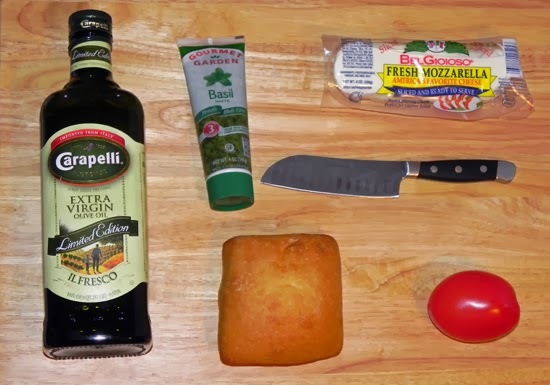 Slice the tomato and mozzarella. I take out the squishy part in the middle of the tomato with the seeds to prevent my ciabatta from getting soggy. Layer on the tomato, mozzarella on to the ciabatta. 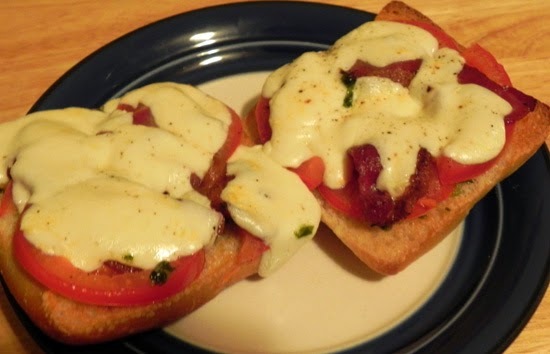 Melt the cheese using the broiler function on your oven or toaster and enjoy.